Rest will not come easy for trainer Chad Summers over the next two days as the 33-year-old conditioner anxiously awaits Saturday night’s $200,000 Lukas Classic Presented by Budweiser (Grade III) at Churchill Downs when he will lead over top Grade I-winning sprinter Mind Your Biscuits as the even-money morning line favorite. Mind Your Biscuits, the brilliant Grade I-winning sprinter who finished second to Diversify in Saratoga’s Grade I Whitney in his first race beyond one mile, will attempt to land his first win around two turns and a possible spot in the Breeders’ Cup Classic (GI) on Nov. 3 at Churchill Downs. The 5-year-old son of Posse shipped to Churchill Downs on Sept. 13 to begin his preparation for the Lukas Classic and Breeders’ Cup. Rising star and Florida-based jockey Tyler Gaffalione will take over the riding duties on Saturday from Joel Rosario, who is booked to ride top Classic contender Accelerate in the $300,000 Awesome Again (GI) at Santa Anita. Gaffalione is expected to stay in Kentucky for Keeneland’s three-week Fall Meet beginning on Oct. 5. Presented by Budweiser, the theme for Saturday night’s “Downs After Dark” event is “Bourbon & Beats.” Guests are encouraged to wear shades of purple and stay on trend with autumn fashion as they celebrate a pairing of Kentucky sounds and spirits. Admission gates open Saturday at 5 p.m. and the final race of the evening is scheduled for 11:10 p.m. General admission is $10 and reserved seat packages start at $25, which are available for purchase on www.ChurchillDowns.com. The National Weather Service forecast for Louisville calls for mostly sunny skies with a high near 71. C Z ROCKET, SEEKING THE SOUL MADE 2-1 CO-FAVORITES IN SATURDAY’S ACK ACK – Frank Fletcher Racing’s four-length Kelly’s Landing winner C Z Rocket and Charles Fipke’s Clark Handicap (Grade I) hero Seeking the Soul were installed as the 2-1 co-morning line favorites in Saturday night’s 26th running of the Grade III, $100,000 Ack Ack Presented by GE Appliances at Churchill Downs. C Z Rocket, trained by Al Stall Jr., cruised to victory in the Kelly’s Landing and, most recently, finished fourth in the Aug. 25 Forego (GI) at Saratoga. The lightly-raced son of City Zip will once again be ridden by jockey Shaun Bridgmohan who took over the riding assignment from Jose Lezcano three starts ago. Breaking just to C Z Rocket’s inside in post No. 6 is Seeking the Soul. The 2017 Clark Handicap winner will cut back in distance to a one-turn mile for trainer Dallas Stewart. The 5-year-old son of Perfect Soul (IRE) will be reunited with jockey Brian Hernandez Jr. who was last aboard the horse two starts ago where he was narrowly defeated as the heavy 1-2 favorite in the Schaffer Memorial at Indiana Grand. Saturday will mark the first start that Seeking the Soul will run around one turn since a third-place effort in a seven-furlong conditioned-allowance race at Belmont Park on June 10, 2017. The Ack Ack is scheduled as the eighth race at 9:39 p.m. The complete Ack Ack field, in order of post position (with jockey, trainer and morning line odds): Awesome Slew (Corey Lanerie, Mark Casse, 6-1); Giant Expectations (Julien Leparoux, Peter Eurton, 3-1); Flatlined (Joe Rocco Jr., Scooter Dickey, 20-1); Warrior’s Club (Chris Landeros, D. Wayne Lukas, 6-1); Nice Not Nice (Gabriel Saez, Buff Bradley, 20-1); Seeking the Soul (Hernandez, Stewart, 2-1); and C Z Rocket (Bridgmohan, Stall, 2-1). All horses will tote 121 pounds. WEST-COAST SHIPPER MAJESTIC EAGLE MADE SLIGHT 5-2 MORNING LINE FAV IN SATURDAY’S JEFFERSON CUP – California invader Majestic Eagle hopes to land his first stakes victory as the slight 5-2 morning line favorite in Saturday night’s 42nd running of the $100,000 Jefferson Cup (Listed) at Churchill Downs. Owned by David Heerensperger and trained by Neil Drysdale, Majestic Eagle arrived at Churchill Downs on Tuesday and the colt is stabled in veteran trainer Neil Howard’s Barn 25. Majestic Eagle narrowly broke his maiden against older horses in April at Santa Anita under Hall of Fame rider Mike Smith. The son of Medaglia d’Oro scored a one-length victory in a first-level allowance race in July at Del Mar prior to his fourth-place effort in the Del Mar Derby (GII) on Sept. 2. Jockey Brian Hernandez Jr. picks up the mount on Majestic Eagle and will break from post position No. 6. The Jefferson Cup is carded as Race 7 with a post time of 9:05 p.m. The Jefferson Cup field, from the rail out (with jockey, trainer and morning line odds): Discovered (Declan Cannon, Daniel Sanner, 20-1); Armed for Battle (Robby Albarado, Jen Patterson, 20-1); Tigers Rule (James Graham, Vickie Foley, 6-1); Factor This (Shaun Bridgmohan, Brad Cox, 12-1); Hot Springs (Ricardo Santana, Steve Asmussen, 3-1); Majestic Eagle (Hernandez, Drysdale, 5-2); Silent Citizen (Albin Jiminez, Efren Loza Jr., 20-1); Captivating Moon (Corey Lanerie, Chris Block, 3-1); King Valero (Samuel Camacho Jr., Alejandro Gonzalez, 20-1); and Dubby Dubbie (Jack Gilligan, Michelle Lovell, 8-1). ROCCO HOPES TO REPEAT WITH QUICK AND RICH IN SATURDAY’S PRESIDENT OF UAE CUP – Locally-based jockey Joe Rocco Jr. will be seeking his record-extending fourth victory in the Grade I, $100,000 President of the United Arab Emirates Cup for Arabian-bred horses when he gets a leg-up on Quick and Rich from trainer Lynn Ashby for Saturday’s sixth running of the 1 1/16-mile race at Churchill Downs. “If I didn’t fracture my wrist in 2016, I would’ve been the only jockey based at Churchill Downs to win this race,” Rocco said. “I broke my wrist in 2016 and Calvin (Borel) rode Paddys Day. I originally had the mount but had to take off. Owned by Tom Fritz, Quick and Rich scored a surprising 19-1 upset victory in last year’s running of the President of the UAE Cup. Rocco holds the record for most wins by a jockey in the President of the UAE Cup: Valiant Boy SBFAR (2014, ’15); Quick and Rich (2017). The President of the UAE Cup for purebred Arabian 4-years-olds and up – the world’s most ancient breed of equines – is carded as Race 10 at 10:42 p.m. (all times Eastern). The complete field for the President of the UAE Cup in order of post position (with jockey and trainer): Quick Sand AA (Sasha Risenhoover, Jerenesto Torrez); Quick and Rich (Rocco, Ashby); Burn Notice MC (Carlos Esquillin, Wallace Neilson); Easter Man (Keiber Coa, Jerenesto Torrez); Uptown Sandy Girl (Corey Lanerie, Ashby); Mystical MHF (Ryan Powell, Simon Hobson); RB Hocus Pocus (Ty Kennedy, Hobson); and Madjikman (Shaun Bridgmohan, Fenneka Bentley). MEET LEADERS – Perennial leading rider Corey Lanerie began Thursday with a 11-10 lead over Julien Leparoux in the jockey standings. Robby Albarado, Shaun Bridgmohan and Ricardo Santana Jr. were tied for third with five wins each. … Louisville-native Brad Cox held a 5-4 win lead in the trainer standings over Tom Amoss and Ian Wilkes. … Calumet Farm, G. Watts Humphrey Jr., Maggi Moss and WinStar Farm, China Horse Club and SF Racing were tied atop the owner standings with two victories, each. DOWN THE STRETCH – Racing continues Thursday for the final Twilight Thursday of the calendar year. The eight-race card kicks off at 5 p.m. with $1 beer, live music from Roadie and local food trucks. The 20-cent Single 6 Jackpot carryover of $10,085 gets underway in Race 3 at 5:58 p.m. (all times Eastern) and the $1 Super Hi 5 carryover of $11,382 is in Race 8 at 8:23 p.m. … Friday is billed as Senior Day at Churchill Downs. Guests 60 and older can enjoy a discounted lunch on Millionaires’ Row for $24. To purchase tickets, call (502) 636-4450. First post Friday is 12:45 p.m. … Saturday is Downs After Dark Presented by Budweiser. Gates open for the 11-race program at 5 p.m. and the first post is 6 p.m. The theme for evening is “Bourbon and Beats” and guests are encouraged to wear autumn-inspired purple colors. For more information about Downs After Dark, visit: https://bit.ly/2Qfn7VX. … Sunday is the final day of the September Meet with a 10-race card beginning at 12:45 p.m. … Trainer Ron Moquett reported Thursday he will ship Forego (GI) winner Whitmore from his base at Churchill Downs to Keeneland on Thursday afternoon to breeze Friday morning in preparation for the Oct. 5 Phoenix Stakes (GII). … Ironhorse Racing Stable’s 2017 Woodford Stakes (GII) winner Bucchero worked a half-mile bullet in :46.80 Thursday morning at Churchill Downs. Bucchero could defend his title in the Oct. 6 Woodford at Keeneland, according to trainer Tim Glyshaw. 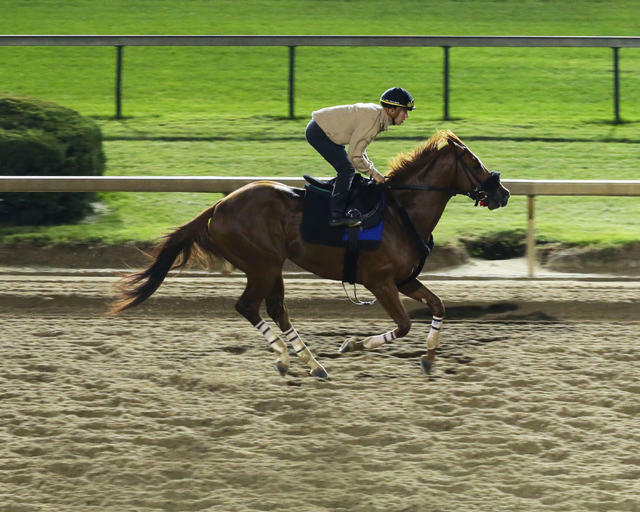 … “Inside Churchill Downs” airs Friday at 6 p.m. on ESPN 680/105.7. The one-hour show, hosted by Churchill Downs Racetrack’s Darren Rogers and Kevin Kerstein will preview the weekend’s critical Breeders’ Cup prep races. Those outside the Louisville region can listen live via the station website at www.espnlouisville.com.